To see the full list of books to be reviewed, please scroll down. This afternoon event will be followed by the 20th Anniversary of AADS Reception in the Graham Center's Panther Suite from 4:00-6:00 PM. Nicole Grégoire is an AADS Fulbright Scholar for the 2014-2015 academic year. Mamyrah Prosper is a Ph.D. candidate in Global and Sociocultural Studies. Jean Muteba Rahier is Professor of Anthropology and Director of AADS. Percy C. Hintzen is Professor of Sociology in Global and Sociocultural Studies. Aranda, E. M., Hughes, S. and Elena Sabogal 2014	Making a Life in Multiethnic Miami: Immigration and the Rise of a Global City. Boulder: Lynne Riener Publisher. Connoly, N.D.B. 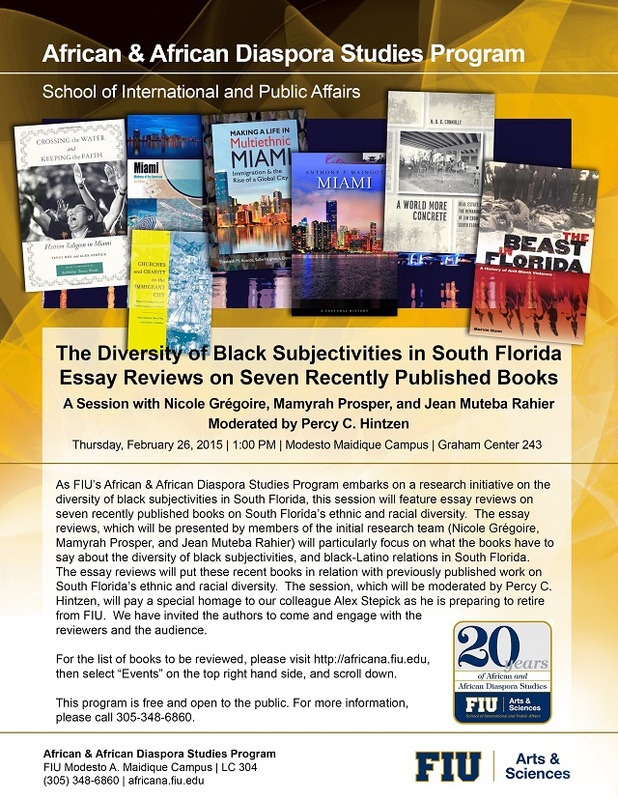 2014	A World More Concrete: Real Estate and the Making of Jim Crow in South Florida. Chicago: The University of Chicago Press. Dunn, Marvin 2013	The Beast in Florida: A History of Anti-Black Violence. Gainesville: The University Press of Florida. Maingot, Anthony 2013	Miami: A Cultural History. London: Cambridge University Press. Nijman, Jan 2010	Miami: Mistress of the Americas. Philadelphia: University of Pennsylvania Press. Rey, Terry and Alex Stepick 2013	Crossing the Water and Keeping the Faith: Haitian Religion in Miami. New York: NYU Press 2013. Stepick, Alex, Terry Rey, and Sarah J. Mahler (Eds.) 2009	Churches and Charity in the Immigrant City: Religion, Immigration and Civic Engagement in Miami. New Brunswick, NJ: Rutgers University Press.